Are The Trilogy Challenge Discs Right For You? Are you on the fence about playing in a Trilogy Challenge and wonder if the discs included might be right for you? Bobby and Eric go over each of the molds included in the 2017 Challenge and describe how they might fly if you’re a pro player or someone who plays casually. Westside Discs has a new stable midrange as part of the Challenge package this year. The Pine gives you control with a really nice feel in your hand and holds up great during windy conditions. It’s a nice compliment to the Warship in the Westside lineup and it’s a great disc for all skill levels. If you need to get a predictable flight path out of your disc, the Pine is the way to go. 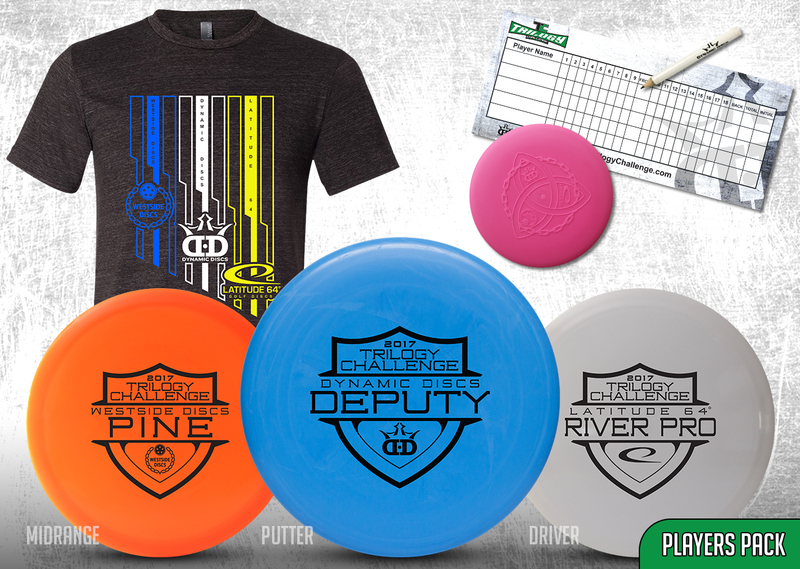 Next up is the latest putter from Dynamic Discs - the Deputy. It’s an easy to throw beadless disc that’s great if you have smaller hands, and it’s the putter of choice for 3X World Champion Paige Pierce. The Deputy is a classic understable putter that will give you a straight line and an awesome glide. Casual players will be excited to see this disc flip up to flat, and those with higher arm speeds will find it holds whatever line you put it on. Finally, we have a pro version of The River! As one of Latitude 64’s best-selling discs of all time, the River Pro is an easy to grip fairway driver that offers a domey profile and a smaller rim. This disc offers a great amount of glide and will be really predictable for a casual player. Pros will find this disc works great when you need an overstable go-to. Remember, the only way to try these discs is to participate in a Trilogy Challenge, so visit the website to find an event near you.